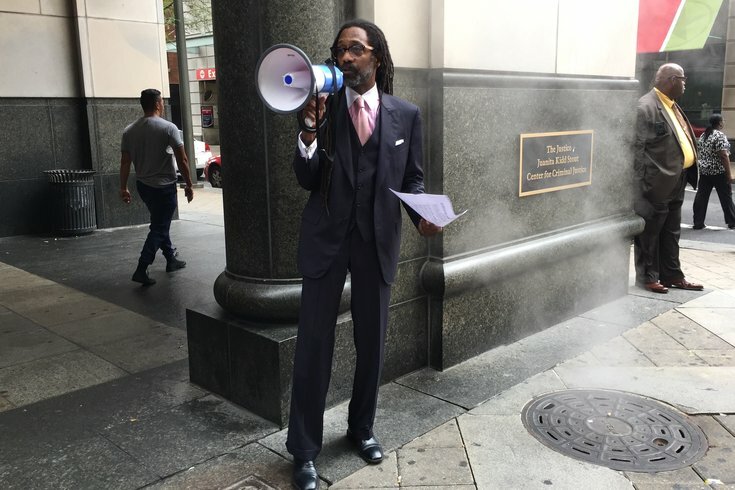 He was disappointed more attorneys didn’t use their lunch break on Tuesday to stand outside the Criminal Justice Center and protest a Philadelphia judge's recent controversial decision, but that didn’t stop Michael Coard from grabbing his bullhorn and stating his case. The protest was a direct result of a new policy from Philadelphia District Attorney Larry Krasner’s office, and a PhillyVoice story about Common Pleas Court Judge Anne Marie Coyle's reaction to it. The case which prompted Tuesday's protest involved Demetrius Mayfield, a 26-year-old Frankford resident with a long criminal history that includes burglary charges in 2012, a drug possession plea in 2015 and a weapons possession charge in 2016. In light of an alleged probation violation, Coyle wanted the prosecution to file a “Daisey Kates motion,” which would allow her to hear that case before Mayfield’s most recent arrest was heard. When the ADA told Coyle he was under “strict orders" from a superior within the office not to proceed, a screaming match ensued. Coyle then took the unusual step of appointing a new prosecutor – a defense attorney in court on a separate case. To Coard – and many others he said he spoke to, and others who spoke to PhillyVoice before and after the story ran – it was an egregious overstep, and one for which the DA’s office has already filed challenges and motions for reconsideration to Commonwealth and Superior Court. “We have judges who are upset that the regressive, reactionary status quo has been challenged,” said Coard, a Krasner supporter was on a lunch break in a murder trial before another judge in the Criminal Justice Center. “There is no law that says she can’t do it, but I’ve heard from attorneys and even judges, people with 30, 40 even 50 years of experience, who told me they’ve never heard of this happening before," he continued. "That's not what she got elected to do." Spokespeople from both the DA’s office and the court system declined to comment on Coard’s 15-minute protest.